Jesus didn’t really do a miracle, right? He just taught everyone to care and share, right? You’ve heard that homily, right? The people had all brought picnic baskets which they kept hidden up under their robes. Jesus convinced them all to pull out their picnic baskets to share with everyone else. 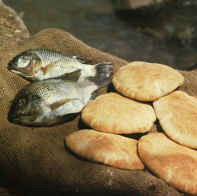 The REAL miracle was not in multiplying loaves and fish, but in teaching people to share. Isn’t that sweet. And after they all shared their food Jesus taught them to sing “Kum Ba Ya” and started a liturgical dance. A good time was had by all! Or so say the trendy homilists! Well I had ENOUGH of that nonsense. I sat at Mass on Corpus Christi Sunday and heard the priest insult the intelligence of everyone in the church. He also insulted the Word of God and the tradition of the Church. He twisted the Gospel reading like a rubber nose and I almost stood up to protest. But my good wife said, “Steve, no! Go home and write!” So I did. About 12 pages later I had written a very thorough response to the priest and to all others who preach this nonsense. I sent a copy to the priest, to his bishop and to Catholic Answers. It was then published in the January issue of THIS ROCK Magazine. I hope this thorough rebuttal of nonsense will be copied and given to homilists. Hopefully we can put this insulting claptrap to bed once and for all. For the whole article buy the January issue of THIS ROCK, or read the unedited and rough version here.